Here is a CZ 452-2E-ZKM with a Military Yougo Mauser stock I did for a friend (He's on the pict with the rifle). With some inletting and work on the trigger guard the adaptation is almost perfect. It's a rifle for plinking but it can make really good group shooting as the barrel's fully freefloat. The only modification to the CZ, the tang of the receiver which is drill and tap for the screw of the Mauser stock. Wonderful rimfire rifle BHarvey, which rifle is this? Brian's rifle will be an upcoming Gun of the Week (once I can get a number of pressing items completed.) Brian has done some very interesting development for us involving barrel indexing. Thanks BHarvey! I want one just like yours!!!! I found out that an Anschutz BR50 is the way to go. 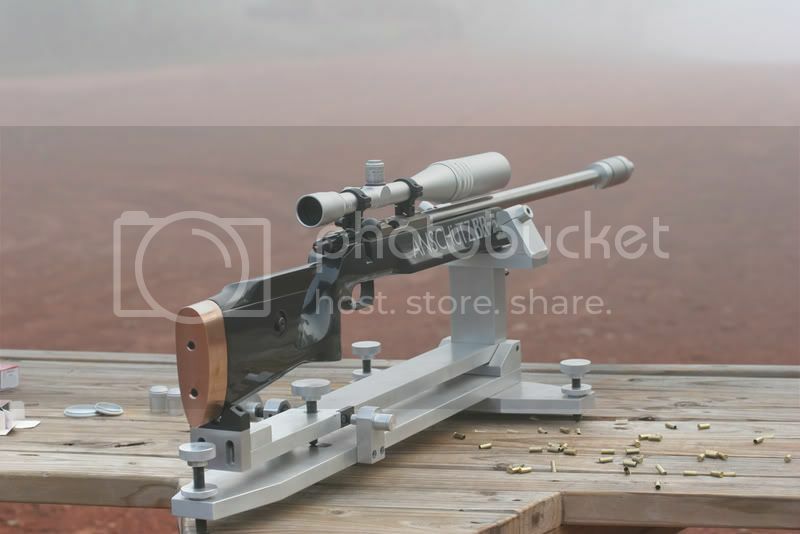 I am just beginning on Rimfire Benchrest and will contact some gunsmiths to see which equipment and price will be the best "package" for my need and pocket. Looks you done some painting on the stock. Also, it looks it have an adjustable cheekpiece. Moderator, I am anxious to read the Gun of the Week article about this Anschutz BR rifle!!! The stock came from Anschutz like it is. I have not done anything to it but pillar bed it. This stock was a factory upgrade option worth $500 over the standard BR50.